Happy Day After St. Paddy's Day as Billy Panther heads off to the land of cheddar for the Panthers first round Women's NIT game at Marquette. Okay so it's more the land of beer and brats since Milwaukee if not exactly what people picture when you mention you are heading to Wisconsin. Unfortunately Billy will be traveling incognito as the real "Billy" is probably off in Ft. Lauderdale or Panama City as Eastern Illinois is on spring break this week. Hopefully with a Panther win, Billy will return armed and ready for the winner of the Western Kentucky/Illinois game. Friday's blog will give a recap of the game, our impression of the Al McGuire Center and maybe a few funs things to do in the other forgotten big city on Lake Michigan. 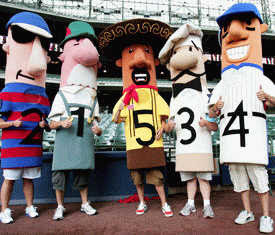 Our hope is that Marquette maybe has some sort of Sausage Race like the do at Brewers games.